In shallow glass or plastic dish or heavy-duty resealable plastic food-storage bag, mix honey, gingerroot, soy sauce and beer. Add beef; turn to coat with marinade. Cover dish or seal bag and refrigerate, turning occasionally, at least 4 hours but no longer than 24 hours. Heat coals or gas grill for direct heat. Remove beef from marinade; reserve marinade. Cover and grill beef over from medium heat about 12 minutes for medium doneness, turning after 6 minutes and brushing frequently with marinade. Discard any remaining marinade. Cut beef into thin slices. 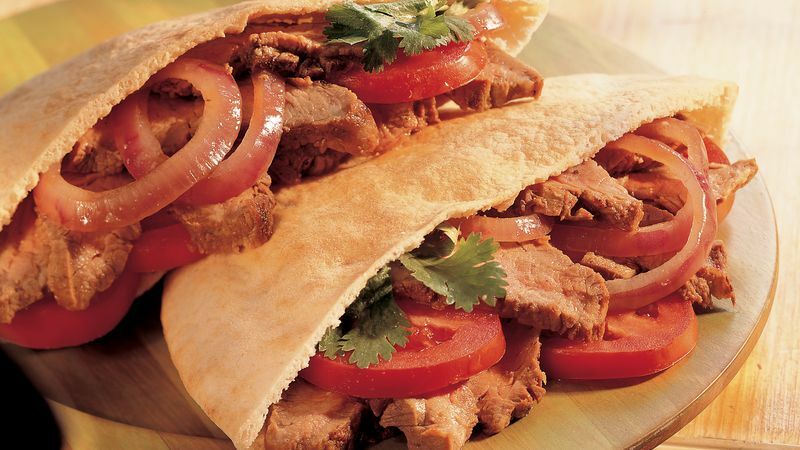 Serve beef in pita fold breads with tomato and onion. If you can't find pita fold breads, use 4 pita breads (6 inches in diameter), cut in half to form pockets. For added crunch while you munch, grill pita fold breads lightly, and top steak with thin slices of cucumber. Cut 2 red onions into 1/4-inch slices. Place slices on piece of heavy-duty foil. Wrap foil around onions, and pierce foil with fork. Grill 5 to 10 minutes or until tender. Serve with beef in pita fold breads.